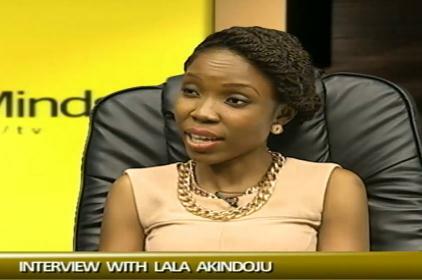 Nigerian Actress, Lala Akindoju, says that it is difficult to choose which one is the better form of art between stage and screen acting as she enjoys both platforms for their uniqueness. Speaking during an interview on Channels Television youth programme, Rubbin’ Minds, she, however, admitted that the thoroughness and hard work that goes into stage productions make them unique and generally seen by many as the purer of the arts. The actress, who shocked Nigerians by winning the Future Awards’ Actor of the Year in 2010 despite having been acting only on stage, spoke about her passion, her struggles and how she found her feet in the competitive Nigerian film industry after winning the award. She disclosed that the award gave her confidence with which she faced the challenges of the business and decided to move on to the screen; a decision which has paid off. Lala also shared her experience during the International Visitors Leadership Programme in the United States, where she claimed to have been exposed to valuable opportunities to drive her ideas, especially as a producer willing to make social impacts. Again, her status as a Future Awards winner also played an important role in her selection for the programme with the recognition it enjoyed at the American Embassy in Nigeria, coupled with recommendations from the Future Project. One of Lala’s social projects is the Open Mic Theatre, an innovative event that provides a platform for actors to showcase their abilities. She gave an insight into the tough beginning of the project in 2011 and how it gradually broke through, and recently securing a partnership with famous producer, Kunle Afolayan, who would be handling the multimedia production. The Open Mic Theatre has grown into a one stop shop for acting talents in Nigeria, with several artistes having gotten jobs via the platform. The Open Mic Theatre YouTube channel has also become an opportunity for fresh actors to build a show reel and market their talents. Since moving on to screen acting, Miss Akindoju has starred in a yet to be released movie by legendary filmmaker, Tunde Kelani. The movie, titled ‘Dazzling Mirage’ tells the story of sickle cell patients and offered Lala her first ever lead role on screen, and she described her joy at having such opportunity, as well as the research and hard work she had to put in to come out great. Lala, having been on stage for 5 years, said that the stage had become her home but she had also become very comfortable on screen and her works would show this to her teeming fans. For many who have been wondering what Lala has with good looking actor, OC Ukeje, as both have been an item for a long time, Lala says “I’m not dating OC Ukeje, never (did) actually and never even almost dated him. On their individual relationship statuses, “I am single…and about his status, he will tell you when you see him”, she said, amidst laughter.